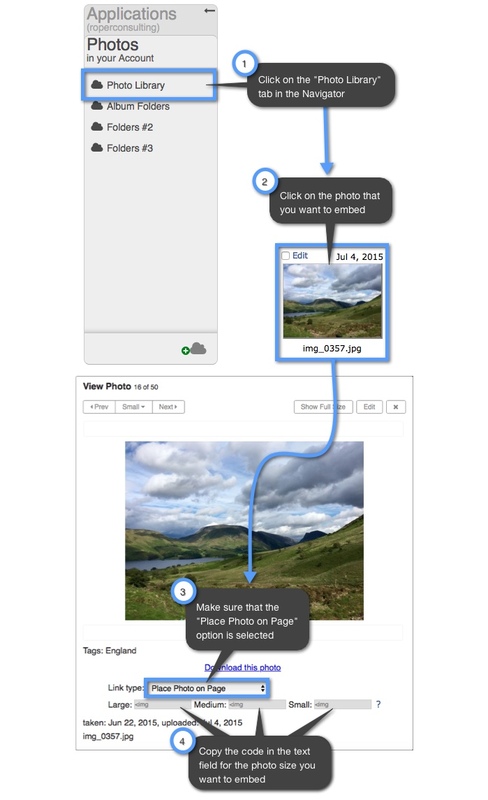 A pop-up photo is when you embed a smaller “thumbnail” image that you can click on. When you click on the thumbnail image, a new window will open with a larger version of your photo. Just like when you are embedding a single photo into your website, you will have three options of sizes to choose from for your pop-up photo. The embedding code will be located at the bottom of each of your photos when you are viewing them in your Keep&Share Photo Library. Once you have copied the pop-up photo code from your Photo Library, you can paste the code into any HTML file that you want. Below is an example of what your copied code will look like. Like with the code used for embedding single images, the pop-up photo embed code as the “img“ tag to specify your image (highlighted in yellow in the example). The “a” tag signifies the link for the pop-up photo. The size of the thumbnail photo (256px x 192px) will remain the same, regardless of what size the pop-up photo is. However, all of the thumbnail images use the standard HTML tag “img.” This means that you can change the size of the thumbnail using additional HTML or CSS tags (e.g., with “width=50 height=50”). To produce the example HTML table above, see the example code below.